Which bot management solution is right for you? Bots are responsible for 30% to 70% of website traffic. They range from good to middling to bad, and from simple to sophisticated. Many bot management vendors say they can solve your bot problem. But can they really? This e-book provides guidance on how to evaluate bot management solutions and understand what the differences mean for you and your customers. 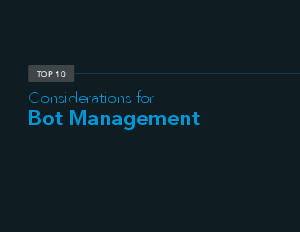 We cover the top 10 things to consider when selecting a bot management solution, from accuracy and API protection to flexibility and resilience over time.